The boys from 88rising are getting together for one of the most anticipated tours of the year. Rich Chigga, Joji, Keith Ape and Higher Brothers have announced a tour spanning nine stops all over Asia this December, starting in Seoul, Korea and ending in Jakarta, Indonesia. Alongside appearances at Singapore's ZoukOut, It's The Ship, and Jakarta's Djakarta Warehouse Project, there will also be standalone shows in China, Kuala Lumpur, Manila and Bangkok. With the 88rising clan on the top of their game right now, the shows are expected to be sold out quickly. While this is an 88rising tour, it is important to note that the Manila date will only feature Rich Chigga. 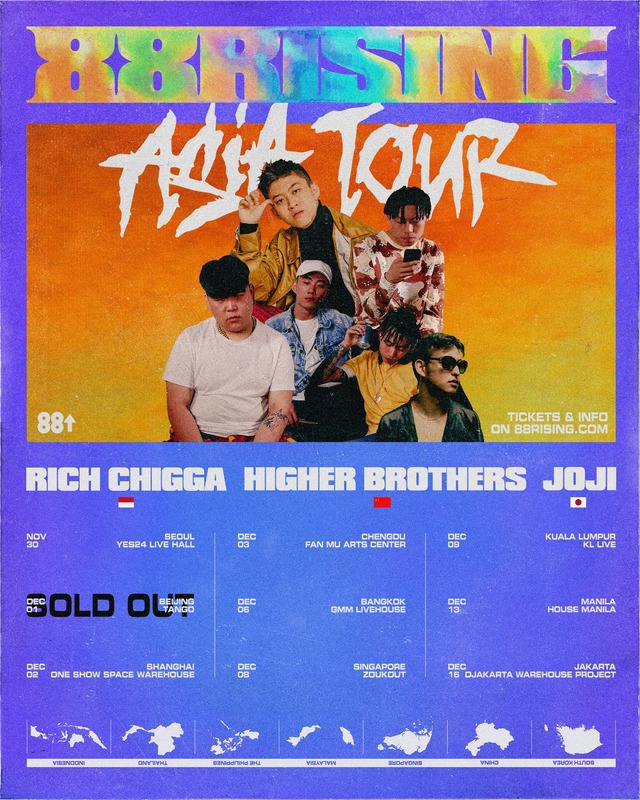 [UPDATE 8 NOVEMBER 2017 2:47 PM] 88rising has released a new poster for their Asian tour, which now indicates that Rich Chigga will be joined by Joji and Higher Brothers for the Manila leg of the tour. Tickets for all the shows will go on sale tomorrow (8/11), through their respective channels.